Madhya Pradesh Housing & Infrastructure Development Board has invite applications for the allotment of houses and flats under its 16 new housing scheme at multiple location of Madhya Pradesh. Along with these housing schemes the authority also invites applications for another new housing scheme named as Aastha Parisar. The project is situated in Mandla (Devdhra) & under the scheme 1BHK and 2BHK flats are on offer for EWS & LIG category under Atal Awasiye Yojna & scheme consist total 80 units. Out of total 69 flats are available for EWS category which are 1BHK type and the plot area of 1BHK flat is about 40 square meter and the estimated cost of 1BHK flats is about 4.50 lakh. The remaining 11 flats are available for LIG Category. The size of 2BHK flat is about 78 square meter which are available at the cost of Rs. 9 lakh. How to Apply: Registration for the scheme can be done through both online and offline modes of registrations. The online registrations can be done using the official website of MP Housing Board & offline registrations details are available in Sambhag Karyalya (Office) Mandla. Registration for the scheme has been started from 18 May 2015 and the last date application submission is 15 June 2015. Registration fees for 1BHK & 2BHK flats is Rs. 200/-. 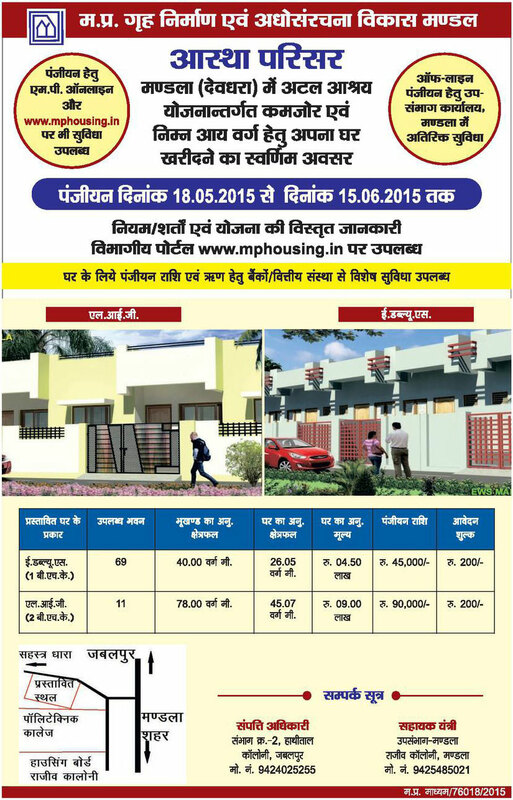 For more details visit the official website of MP Housing Board.